In the Netherlands we are used to abdications. This year, 2013, our queen Beatrix will hand over the throne to her son Willem Alexander, as her mother Juliana did thirty three years ago, and her grandmother Wilhelmina in 1948. But an abdicating pope has not been seen since over six hundred years ago, as they all died whilst in function. On February 28, Pope Benedict XVI will retire, and his successor will be selected by the cardinals among themselves. This procedure is called the conclave. During the conclave the cardinals are completely secluded. This includes having no television, radio, internet or cell phones. The conclave of 2005, when Pope Benedict XVI was elected, was the first during which the cardinals stayed in a separate guest house, which was build in 1996 near Saint Peter’s Basilica. The conclave is still held in the Sistine Chapel, and until 2005 the cardinals were locked in that building with their servants. In the sixteenth century they slept in ‘simple cells’ where they ate in seclusion. All food and other necessities were handed to the servants, the conclavists, through a rotating portal. In his cookery book Opera dell’ arte del cucinare from 1570, the Italian cook Bartolomeo Scappi describes the funeral of pope Paul III (1468-1549, born as Alessandro Farnese) and the ensuing conclave, which extended from 29 November 1549 to 7 Februari 1550. He also describes the cells the cardinals stayed in, and states that they were about 5 meters long and wide (25 square meter). The cells of the cardinals that were ordinated by the last pope were completely covered in purple cloth, which included the walls, curtains, tablecloth, bed linen, pillows and cushions. The cells were furnished with a bed and table, two stools (one of which was meant to bring to the voting hall), a chamber pot, a clothing rack, a large jar with a copper lid with a lock. Every object was purple and decorated with the arms of the cardinal who was sleeping in that cell. There was also a hamper which was used to carry food from the rotating portal, the porta, to the cardinal. It was a coming and going of servants at the serving hatch, or the Ruota del Conclave. Each evening, the order in which the cardinals were to be served the next day was established by drawing lots, and a notice was put on the inside of the Ruota. Any cardinals who were ill were served first. And some cardinals were very ill, some had to leave the conclave and two of them died shortly after. The cardinals ate alone, in their cells, and each placed his order of dishes individually. Before he could eat however, all food and beverages were tasted and checked for hidden messages. Closed pasties were opened, stuffed birds cut in half, and all forms of drink were only allowed in vessels of clear glass. On the picture above you can see this checking of the cardinals’ food and the serving hatch to the conclave, a detail from an engraving in Opera of Scappi. 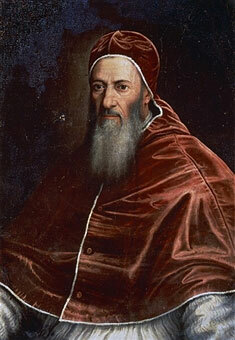 After more than two months Cardinal Giovanni Maria Ciocchi del Monte (1487-1555) was elected pope, and he accepted the name Julius III. On the right is a portrait of Pope Julius III. He was not a very good pope, indulging himself in luxury and excess. In Scappi’s Opera there is a dish which, according to its name, was a favourite of the pope, “torta bianca reale, quale usaua Papa Iulio III” (Book V, recipe 80). This recipe is described and adapted below. The Dutch cookbook Verstandige kok from 1667 has a taert that has some similarities with this torta, but the filling is not made with fresh cheese. Instead it uses cream, thickened with flour. 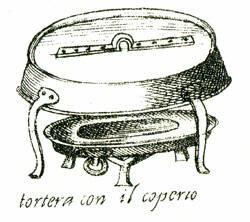 The tourte is from Opera dell’ arte del cucinare of Bartolomeo Scappi, published in 1570. You can read more on Scappi and his book on the page of his recipe for Tortelli in brodo. Other recipes from this cookery book are: Broccoli en Soup with fresh broad beans. This recipe is part of the fifth chapter, which is entirely about pastries (“diuerse sorte di pasticci, crostate, torte, & altri lauorieri di pasta, cotti al forno, sotto il testo, & fritti”), and divided into meat days and fish days. In this chapter there is a subdivision with recipes for “torta reale”: flat, wide tourtes with a filling containing almonds or pine nuts. But the torta reale of this page contains neither almonds nor pine nuts. The recipe following this torta bianca reale is for a torta bianca commune, a simple tourte. The filling consists of rasins, ricotta and Parmesan cheese, and does not contain any sugar. The tourte may be decorated with plated gold or silver before serving. Yes, very simple! The tourte is prepared in a tourte pan. Scappi’s Opera contains more than twenty plates with illustrations of kitchens, kitchenware, serving dishes, furniture and necessities for the cardinals in conclave, and even a field kitchen. The illustrated objects are not always related to food, as there are for example also a ladder and a foot stove. Amongst many pans and cauldrons there are also some tourte pans. The picture on the left shows such a tortera or tortiera. Coals were heaped on the dish between the legs, and on the cover with raised rim more coals were heaped. In this way the content of the pan would receive heat from both top and bottom, so an oven was not necessary. Such tourte pans would remain in use until the nineteenth century (see the recipe for Cheese pie with pears). In North-America, the Dutch Oven, as it is sometimes called, is still in use. The original text is from the facsimile-edition of 2002 (see bibliography, vol.2, p.357/8). For the translation I used the English translation of 2008 by Terence Scully (see bibliography, pag.474), but I have not literally reproduced his translation, although his is no doubt much better (buy the book!). Consult the bibliography at the bottom of this page for the editions. Take two pounds fresh provatura, made that same day, and pound it in a mortar so it will become like butter. Add three pounds fine sugar, three ounces rose water, and three ‘milkheads’ of the same day, or a beaker cream, and fifteen fresh egg whites. Work all of this through a strainer. Take a tourte pan, greased with cold butter and sprinkled with flour, and put the filling in it. Cook softly on a slow fire, hotter from above than from below. And when it is almost done, make the sugar glazing, and before taking it out of the oven, give it a lustre with egg whites, like marzipan. Serve hot or cold, as you like. 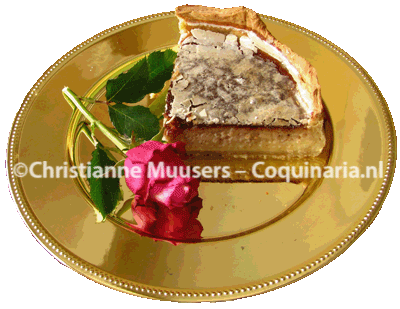 If the tourte is prepared in the month of May, it will be much better because of the provatura and milk. And you can also make it with dough, adding in egg yolks and common spices, with apple juice. The tourte looks white on the inside, but the top has turned brown. The sugar glazing makes it look white again. A milk head is the cream which will float on top of frresh milk when it is left for a while in a cold place. Scappi describes the preparation in recipe VI.145, and Scully gives an estimate of the quantities on p.471 of his edition in note 73.2. Attention – When preparing the crustless version, that also does not use the egg yolks in the filling, it is especially important to use a shallow dish or mould, and make the layer of cheese, eggs and cream no thicker than 1 inch (2.5 centimeter). Otherwise the filling will not thicken adequately. 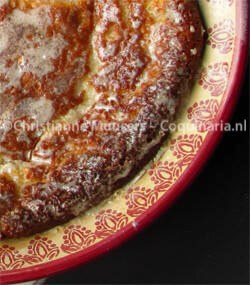 On the picture below the tourte looks very flat, so I have added a detail with the contours of the tourte. Blue is the crust, yellow the filling, red the top of the filling. The rest is a mirror image. Pastry or dessert for 6 to 8 persons; preparation in advance 20 minutes + preparing dough if used; preparation 1 hour and 15 minutes. Crumble the mozzarella and pound with sugar, rosewater and cream to the consistency of custard. Or do as I did and use a kitchen machine equipped with a dough hook. Separate the eggs. If you make the version with dough, you can add the yolks to the filling, and otherwise you could use them for something else, like Custard or Crême brûlée). According to the original recipe the egg whites are added to the filling straight away, and the filling is then strained. But it is also very good to beat the whites stiff and then add them to the filling later. This will result in a lighter dish. Without dough – Preheat the oven to 300 °F / 150 °C. Grease a shallow dish with butter, sprinkle with flour and shake the dish upside down to remove all excess flour. Pour in the filling, and place the dish in the oven, above the centre so it will receive more heat from above then from below. Bake for an hour, then continue with the glazing. With dough – Preheat the oven to 400 °F / 200 °C. Grease a pie dish or spring form with butter and cover with a sheet of dough. Cover this with a greased sheet of aluminium foil (greased side downward) and fill this with uncooked rice, peas or beans. Put the form below the centre of the oven and blind bake for 30 minutes. Then remove the dish from the oven and remove the aluminium foil with the filling. You can keep the used rice/peas/beans in a pot and use them again and again. Lower the oven heat to 320 °F / 160 °C. Pour the filling into the pre-baked dough and bake the tourte in the centre of the oven for 45 to 60 minutes. Continue with the glazing. 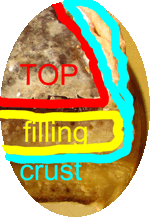 Glazing – Whether preparing this tourte with or without dough, the top will be glazed. Stir egg white, icing sugar and rose water to a thin paste, and spread this over the filling. Put the tourte back in the oven for another fifteen minutes at 200 °F / 100 °C. The glazing must become dry, but not change colour. I used a spring form for the tourte with dough. The filling was not completely solid when I took it out of the oven, but when it had cooled to room temperature, it was perfect. According to Scappi the tourt can be served either hot or cold. However, the stuffing will thicken more when it has cooled, so I and my tasters preferred the room temperature version. Moreover, a cold dish will taste less sweet than a hot one with the same amount of sugar. The tourte is very filling, so serve small portions. It was mostlyserved during the last course, but today it also tastes great with a cup of tea or coffee. The tourte keeps at least two days in the refrigerator. 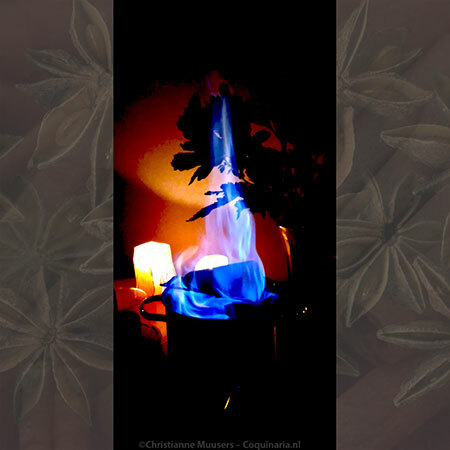 We have spice mixtures, think of curry powder, but during the sixteenth century (and earlier, in the Middle Ages) cooks also prepared ready-made spice mixtures. Scappi describes such a standard mixture. If you choose to bake the tourt in a crust, ‘ ordinary spices’ are added to the stuffing. These are: cinnamon, cloves, ginger, nutmeg, sugar, grains of paradise and saffron, with the proportions of 9:4:2:2:2:1:1. Scappi uses a half oncie as unit, about 14 grams. Added up you’ll have 9.4 ounces (266 gram). If you mix the spices for this one tourt, use a pinch as smallest unit. 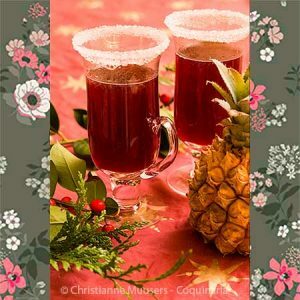 So, a pinch each of saffron and grains of paradise, a quarter teaspoon each of ginger, nutmeg and sugar, a half teaspoon ground cloves and 1 teaspoon cinnamon. Those of you with a wide screen will see a background with the papal weapon as displayed during the time there is no pope, the sede vacante. This spice was used in the European kitchen from the thirteenth to the eighteenth century, and was at the top of its popularity in fourteenth century France. The plant (Aframomum melegueta)) is related to ginger, but it is the seeds that are used as spice. It is still in use as spice in the region of West Africa, where it is indigenous. Since it is not easy to come by, you can also use an alternative. Cardamom is often mentioned, but you get the best effect if you add a little black pepper to the cardamom.. Originally these cheeses were made from buffalo milk, but nowadays they are mostly made from cow’s milk. There simply aren’t enough buffalos to provide all the milk needed for the production of these cheeses! Just use ordinary Mozarella or Provatura if you can’t get cheese from buffalo milk. This ‘torta bianca’ was a favourite dish of Pope Julius III in the 16th century. Sweet and filling, but VERY good!